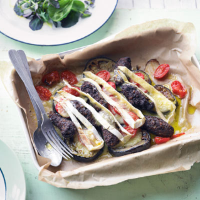 Serve these baked lamb and aubergine koftas with salad, crusty bread and tzatziki for a perfect Greek style supper. 1. Preheat the oven to 220°C, gas mark 7. Chop 1 aubergine into thick slices and place in an ovenproof dish. Spritz with oil spray then cook in the oven for 15 minutes. 2. Nestle the koftas from a 144g pack Waitrose Delicatezze Lamb & Pork Koftas between the pieces of aubergine. Halve 150g baby plum tomatoes and scatter over the top. Bake for 10 minutes, then lay 60g sliced Brie on top and return to the oven for a further 10 minutes. Serve with a green salad and crusty bread.